Saratoga Springs, N.Y. - Hattie&apos;s Restaurant and owners Jasper and Beth Alexander have announced that Saratoga Performing Arts Center will be the beneficiary of their popular Annual Mardi Gras Party and fundraiser, to be held on Saturday, January 19, 2013 at the Historic Canfield Casino in Congress Park. SPAC President and Executive Director Marcia White lauded the Alexander&apos;s generosity and announced that all funds raised at the event would be specifically dedicated to supporting the New York City Ballet&apos;s residency. "My warmest thanks go out to Jasper and Beth Alexander for choosing SPAC as the beneficiary of this year&apos;s Mardi Gras fundraiser. Hattie&apos;s is not only a culinary landmark, but, under the leadership of Jasper and Beth Alexander, a champion for the quality of life in Saratoga," said Marcia White, SPAC&apos;s President & Executive Director. "Upon learning of Jasper and Beth&apos;s extremely generous decision, we immediately decided that all funds raised would be designated for New York City Ballet&apos;s SPAC residency. The Ballet has a rich legacy in Saratoga that has woven itself into this community&apos;s identity and culture. Hattie&apos;s fabulous Mardi Gras event will be the perfect opportunity to celebrate this legacy and support the ballet while enjoying one of Saratoga&apos;s most talked about events." Founded by Hattie&apos;s owners Jasper and Beth Alexander in 2001 as a way to support local nonprofits, the annual Mardi Gras event has raised over $250,000 for various charities since its inception including Shelters of Saratoga, Saratoga YMCA, Saratoga Hospital and Saratoga Sponsor a Scholar. Elizabeth Alexander, co-owner of Hattie&apos;s and also a teacher at Myers Dance School and dancer at Northeast Ballet said, "I am thrilled that this year&apos;s proceeds will benefit SPAC&apos;s residency of the New York City Ballet. I grew up going to SPAC and experienced the magic of the ballet firsthand. At age four while watching Jerome Robbins Dances at a Gathering I told my Mom I wanted to dance...I haven&apos;t stopped yet!" "Beth and I are very proud of our commitment to our community and are grateful that this event has become so popular because it has allowed us to provide significant help to organizations that are important to us," said Chef/Owner Jasper Alexander. SPAC&apos;s residency of the New York City Ballet dates back to SPAC&apos;s 1966 inaugural season. Each year since, the Ballet has had a summer engagement in Saratoga which has enabled a wider audience to experience its artistry and helped establish Saratoga as a world-renowned home for dance. In recent years, the rapidly escalating costs of the residency have become difficult for both NYCB and SPAC to absorb, creating a greater need for fundraising specifically dedicated to supporting the ballet season. Benita Zahn of News Channel 13 will be the MC for the evening&apos;s festivities. Garland Nelson and Soul Session will provide entertainment, along with the dancers from Northeast ballet. 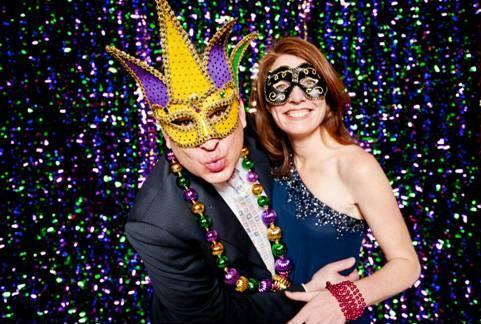 Heather Bohm-Tallman will be on hand for Mardi Gras photos with her crazy booth. The event will also offer complimentary cocktails from 6:00pm-7:00pm, Mardi Gras-inspired cuisine by Chef Jasper Alexander, cash bar and a silent auction. (valet parking available). Reservations are $100.00 per person and can be made by calling Linda Passaretti at SPAC at 518-584-9330 ext. 122. Hattie&apos;sTM has been a Saratoga institution since 1938. In addition to Hattie&apos;s original restaurant on Phila Street in Saratoga Springs, the Alexanders also operate Hattie&apos;s Track Shack at the Saratoga Race Course and a quick service restaurant in Wilton New York. The restaurant has achieved national recognition with features in The New York Times, Gourmet Magazine, and other prominent publications. In 2006, Hattie&apos;sTM Restaurant was featured on the Food Networks&apos; Throwdown! with Bobby Flay.